In a large bowl, toss together the salad, chicken, and berries. Set aside. 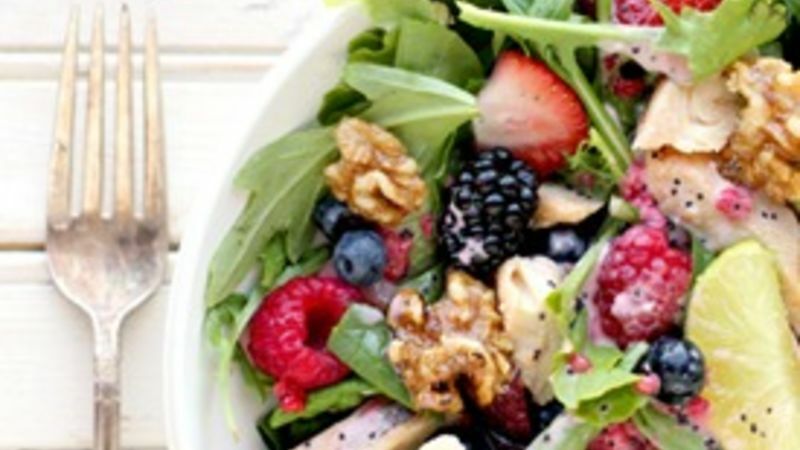 Assemble the salad by tossing the salad and berries together with the walnuts. Top with dressing. Serve immediately and enjoy! Grilling season is in full swing, and it's not going to be long before you have a fridge full of leftover grilled chicken and an appetite that's less than craving yet another batch of the barbecued stuff. This simple Grilled Chicken Salad recipe is a great way to use up leftover grilled chicken, or to just liven it up with a fresh, healthy flavor. It's quick and easy, and covered in a homemade poppyseed dressing so good, you'll want to swim in it. The flavors of this salad are unexpected, but absolutely incredible together. The garden-fresh bite of berries goes beautifully with the tangy, lime-kissed flavor of a creamy salad dressing. A smidgen of home-carmelized walnuts adds crunch, and boy, oh boy. Are you going to like the melding of textures and tastes. Absolutely delicious. Berries can be expensive, so look for a package of mixed berries, often available in the refrigerated produce section of your local grocery store. It's often easy to find a package of cleaned, mixed berries at a savings from what you'd spend if you were to purchase a pint of each of the berries called for in this recipe. Now, what are you waiting for? It's time to mix up some tasty salad greens, grilled chicken, and general awesomeness. Yumminess awaits! Still have some leftover chicken? Don't worry, we've got you covered with plenty of chicken recipes just waiting to be devoured.